Long trips or commuting on the public transit does not seem boring at all when you have your favorite music playing in your ear. However, when you are using the subway underground, you can’t exactly stream music online because of the poor network. Even if you could, each track would take a long time to buffer, and would likely be of poor quality with a lot of static. Thus, the experience would not be ideal. Moreover, streaming music online drains your iPhone’s battery which can be annoying; especially if you need to use your iPhone throughout the day. Being able to listen to music offline is tricky when you own an iPhone since you will need to add your purchased songs to the phone so that you can access them offline. Adding music to your iPhone can also prove to be challenging. You will need to update your iTunes, sort out different playlists and so on, before you can even transfer any songs to your iPhone. Hence you are not able to gain access to offline music easily without getting some form of assistance. Moreover, when you own an iPhone, you know that you do not have a way to listen to the traditional radio. Thus, you do not get access to the latest hits, or discover any new music. 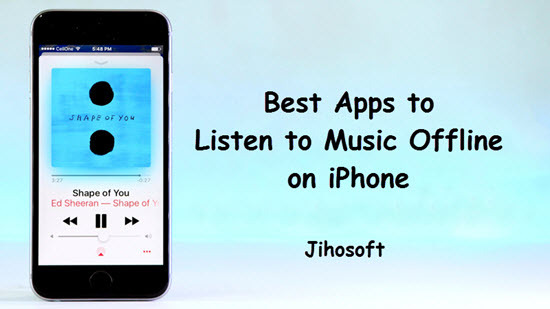 Hence, several app developers have come up with music applications that allow you to listen to your favorite music offline on iPhone. And now you can reach your music library anywhere and at any time with these best offline music app for iPhone users. Tips: If you lost any precious data like photo or video from iPhone, you can always use Jihosoft iPhone Data Recovery to get them back easily from iOS devices. When it comes to music apps there are quite a few which seem to be vying for the top spot. However, only a few of them make the cut when you narrow down your preferences to offline streaming as well as ease of use. The best apps for you to access your music library without an internet connection on iPhone are listed below. Spotify for iOS is perhaps one of the most popular music application among iPhone users. This nifty mobile app works exactly the same way as the desktop one. You can create, listen to and share different playlists which is categorized according to genre mood, artists, or some other aspects. You can not only stream virtually any music from any artist, but also listen to music offline if you do not have a strong internet connection on your iPhone. With a Spotify Premium membership you will be able to add up to 3,333 songs on your offline playlist. If you happen to lose internet connectivity, the app automatically switches over to offline mode. 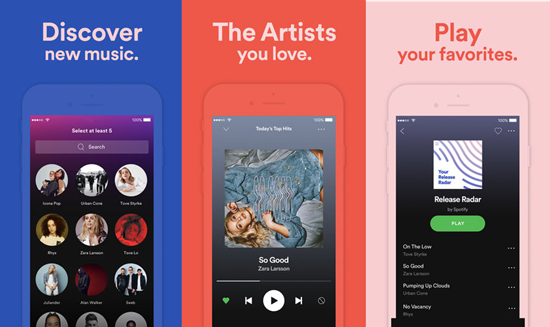 Spotify’s homepage also features different playlists which are sorted according to what you listen to as well as your region; hence, it acts as a music recommendation app as well. Pandora music app is the most frequently downloaded music app for iPhones and for good reason. This app is easy to use, having clean and “no frills” approach to the app design. You can create a custom station by entering the name of an artist that you like, or a song that you love at the moment. Once you do so, it will create a custom playlist or station which features songs as well as artists similar to the ones that you like or play the most at the moment. It allows you to improve the recommendation by allowing you to thumb up or down a particular station. Don’t worry, you will not be stuck listening to random music that an AI picks out for you because you can easily add new tracks or artists to the station whenever you like. 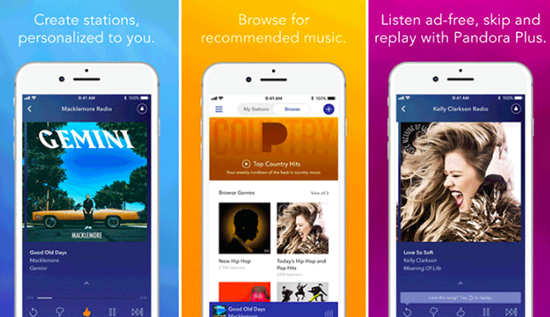 With Pandora you can download music to listen when your iPhone is offline. 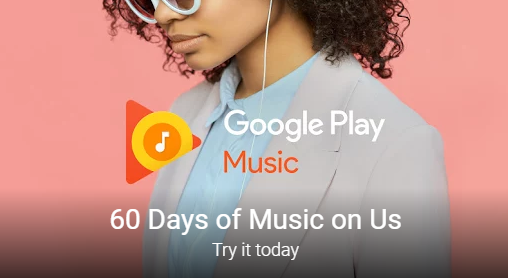 Although developed by Google, you can find Google Play Music on the App Store as well. 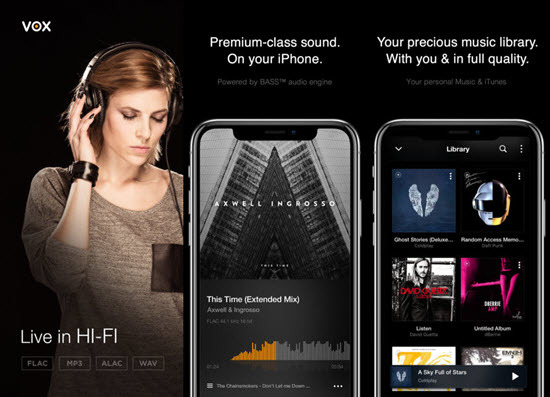 With this app you can stream music offline when you have a subscription, and even store up to 50,000 songs to listen to without paying an extra dime. Just like Spotify, Google Play Music also offers recommendation based on region as well as listening habits. If you are a fan of listening to radio, then Slacker Radio is the best fit for you. With this app you can download your favorite radio stations, tracks and playlists. When you are connected to the internet simply hit the refresh button so that you can enjoy your music when you are offline. This app is a great alternative to Pandora on iPhone. Whenever you feel like sitting down and listening to the radio, just hit play on this app! 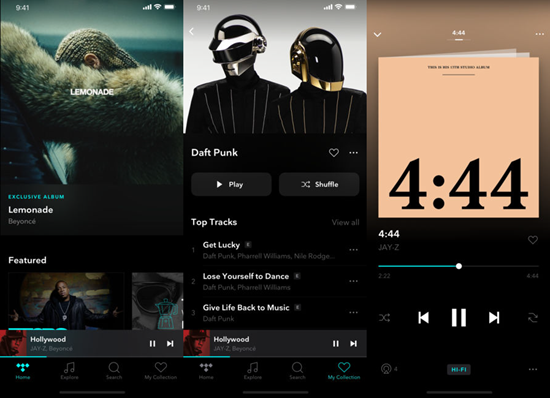 With Tidal app, you can enjoy your music offline and much more on iPhone. When it comes to quality this app definitely offers you the highest quality of audio that you can find. Here, you will find high definition music as well as videos. Apart from this, with TIDAL you can gain access to over 40 million songs and exclusive playlists that have been curate by music artists and journalists. With this app you will get clarity in your audio and be able to enjoy your music exactly the way that the music artist has intended! Vox Music Player will offer you cloud space so that you can store your favorite songs on this app easily. Moreover, it allows you to listen to your music offline on iPhone effortlessly. This application also offers a radio feature that allows you to explore new music and artists based on your listening habits! The app has a user friendly interface which makes it a favorite among many iPhone users. When you own an iPhone, it can’t get any better than this! 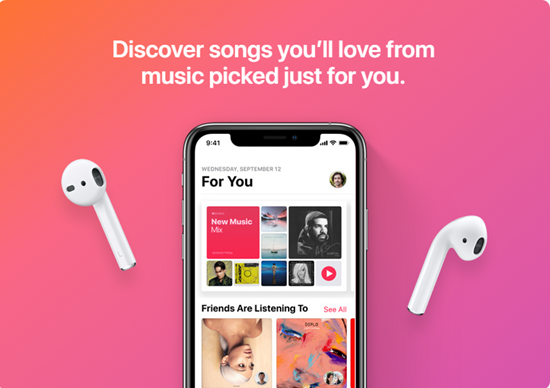 With Apple Music, you can not only explore new stations sorted according to genre, artists and mood, but you can also download your favorite tracks to stream when you can’t access the internet. One undesirable aspect is that you have to download tracks and playlists individually which might be challenging if you have a vast music collection. However, if you want to continue using and listening to music offline with this app, you must choose a plan after its free trial. 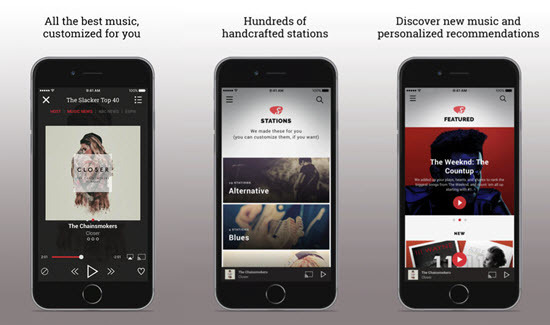 This app takes streaming music online to the next level. With Microsoft’s Groove Music you can make sure that all your purchased songs are in one place. This app also lets you add music purchased from other devices to your music library as well. If you want to listen to your music offline, all you have to do is go to the app setting and turn on the “automatically download all music” tab and you will be able to peruse your music collection whenever you please! Music is a way to relieve for many, and it is known to elevate your mood. If you are able to access and listen to your music any time that you want, you will then relax easily throughout the day. With the help of the above mentioned apps you will be able to gain access to clear as well as high definition music even when you are offline on your iPhone. Hence, these offline music apps will save you from being bored during long hours of commute! If you have any question or suggestion, welcome to leave a message in the comment below.